Why book John F Kennedy Airport car rental at VIP Cars? Rent a car at John F Kennedy Airport with pricing inclusive of CDW, Theft Waiver, Unlimited Mileage etc. Who doesn’t like to save money on a trip? And to be able to save, while traveling in comfort is an option most people won’t refuse. On your next trip to NYC, hire a car for JFK Airport and drive around the city with the utmost ease and forget the hassle of getting into a cab every time you want to go somewhere. If you’re entering New York via the John F. Kennedy Airport, you can skip the part, where you stand in a long queue to hire a car, by booking your rental car online before you land at the airport. VIP Cars gives you the best options when it comes to rental cars for JFK Airport with added benefits and exceptional services planned. It is advisable to hire a car for John F. Kennedy Airport well in advance as being a busy airport, the demand for rental cars is always high. Widest variety of rental cars for JFK Airport among multiple segments, ranging from mini/compact to SUV/luxury. Beneficial standard insurances by suppliers, including Collision Damage Waiver and Theft Waiver. Add-ons such as, navigation systems and extra child seats available for more comfort. Highly secure online payment system that accepts multiple currencies. 24x7 booking support supplemented by highly trained customer care executives. These major international car rental companies, along with some local car hire companies, offer services at the JFK Airport. The car rental service desks are located in the baggage claim areas in all terminals. Driving a rental car in New York is much cheaper than traveling in cabs. When you’re driving on your own, you have the option to take the scenic route. Due to rising competition between car hire suppliers at JFK, the prices are cheap. Freedom to travel anytime and anywhere as per your own schedule. In case the renter intends to cross a border to a different country/state, it is advised that the renter informs the supplier regarding the permissions. In the event of crossing borders, additional charges and documents may be applicable depending on the location and the supplier. If your flight is scheduled to land late at night at the John F. Kennedy Airport, the supplier may charge some additional fees to provide the rental car at out-of-service hours. In the case of a delay in your flight, the suppliers usually agree to provide services out of their normal working hours, and additional charges may or may not apply, depending on the car hire supplier. If the customer wishes to cancel his/her John F. Kennedy Airport car hire deal, it is possible at any point of time. However, it must be noted that a full refund is given only if the customer informs about the cancellation at least 48 hours before the pickup time. In the event of a no-show at the time of the pickup, no amount is refunded by the supplier and VIP Cars. One of the three major airports that serve New York, John F. Kennedy International Airport ranks among the busiest airports of the United States. Handling flight operations of nearly 90 airlines, the JFK, which is also known as New York International Airport, caters to nearly 58 million passengers every year. Kennedy International features six terminals, four runways, and parking space for about 15,000 vehicles. The airport's terminals are connected by the AirTrain system, a rail service for travelers arriving at John F. Kennedy. The retail outlets at John F. Kennedy Airport offer a wide range of products, from budget-friendly travel essentials to high-end luxury products. Given below are the names of leading shopping outlets at the JFK Airport. The duty-free retail chain is engaged in selling a wide range of merchandise such as handbags and cosmetics. A one-stop destination for buying various types of stocking boards, swimwear, and other accessories. The retail shop features a selection of newspapers, magazines, books and a variety of snacks as well as drinks. A renowned electronics retail chain that sells headphones, tablets, cameras, speakers, and other accessories. A jewelry retail chain that features a wide range of rings, necklaces, and variety of customizable bracelets. 6:00 a.m. – 11:00 p.m.
A well-known name in travel essentials' category, ExOfficio sells a wide range of travel-oriented merchandise. 5:30 a.m. – 10:30 p.m.
Eat fresh at the JFK Airport, which is home to so many world-class restaurants and fast-food joints. We present you with the names of leading eating joints that offer fresh food round-the-clock. The over-the-counter retail food chain is known for its burgers, cakes, and freshly prepared frozen custard. The eating joint is popular for its selection of seafood dishes, dry-aged beef, and a wide variety of cocktails. Expect freshly prepared pastas and other light Italian snacks at this food outlet, which also serves you focaccia for free. The food chain is famous for its chicken dishes, waffles, burgers, and a huge selection of hot and cold beverages. The well-known fast-food joint is known for its baked potatoes, burgers, quick snacks, and variety of shakes. 5:00 a.m. – 9:30 p.m. The world-famous fast-food chain is famous for its wide range of burgers, crisp fries, sides, and different shakes. The JFK Airport is home to plush lounges that let you sit amid comforting settings. Equipped with all the latest amenities, the lounges are accessible via lounge pass or after paying at the door. 4:30 a.m. – 11:00 p.m.
10:00 a.m. – 11:30 p.m.
2:00 p.m. – 8:30 p.m.
4:30 a.m. – 12:30 p.m.
4:30 a.m. – 9:30 p.m.
A truly multifaceted metropolitan city, New York is known for its exquisite art, fine dinning, and plentiful of shopping destinations. Full of energy and enthusiasm, NYC greets you with a friendly warmth that makes your trip a delightful bunch of memorable moments. 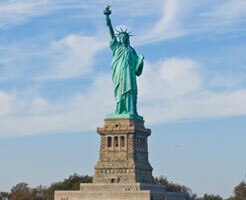 Check out the names of top attractions that you can visit in your New York Airport car rental. The most urbanized park in New York, where you can take a walk in the vast estate or visit the Central Park Zoo inside the park. 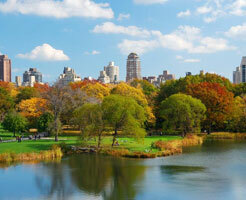 Other activities include bird-watching, boating and carriage rides. The most iconic building in New York, it has 102 floors and offers the most stunning panoramic views of the city from the observation deck on the top. France’s gift to America in the 1800s, this neoclassical sculpture still stands strong and high, and is one of the most visited places in New York. 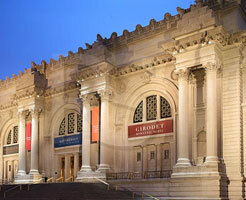 One of the largest museums of the United States, the Metropolitan Museum of Art features an extensive collection of art works and paintings from Egypt, China, India, Africa, and Oceania. Accelerate with utmost caution within the city as NYC follows a stringent speed limit of 30 mph. Avoid turning to the right lane as it’s illegal and most of the buses stop there for people to hop on and off. Though most people ignore it, honking is illegal in New York City and carries a fine of $350. Experiencing crowd in a city that never sleeps is quite understandable but not driving beyond city's conventional boundaries is questionable when you have a low-cost JFK Airport car hire. 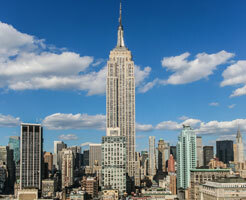 Check out some exciting day trip destinations that you can cover during your trip to NYC. New York to Washington D.C.
A no ordinary day trip, your visit to the US capital will be as insightful as you would have expected it to be. Get ready to stay amused as you come across notable landmarks such as, the White House, Arlington Cemetery, Washington Monument, Smithsonian's National Air & Space Museum, and Lincoln Memorial. You'll enter Washington DC after crossing the East Coast states of Maryland, New Jersey, and Delaware. Discover Philadelphia, one of the most popular American cities, and home to several notable attractions such as, Elfreth's Alley, Liberty Bell, Benjamin Franklin Parkway, and the Independence Hall among others. A one of its kind unique experience centered around the country's historic heritage, day trip to Philadelphia and Amish Country is a perfect getaway tour for those inclined to learn more about the history of the United States. Another popular getaway destination for tourists arriving at NYC, Boston welcomes you with its glorious past and widely renowned universities. Enjoy a great drive via Hartford, capital of Connecticut, and stop by Cambridge to enjoy a leisurely stroll in Harvard Yard. Drive around Boston's famous landmarks such as, Freedom Trail, Faneuil Hall, New England Aquarium, Boston Common, and Museum of Fine Arts. Don't forget to eat traditional food at Quincy Market.